“How did we end up here? 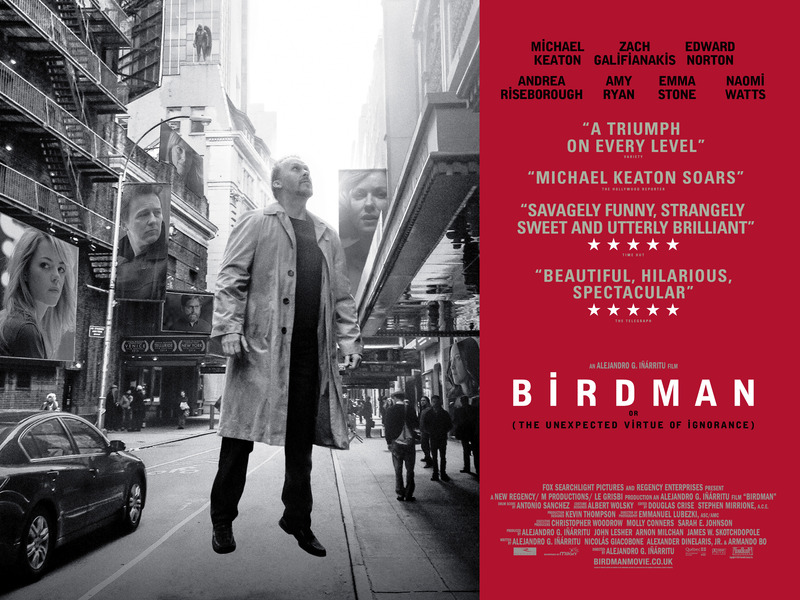 This place smells of balls.” says the disembodied voice of Birdman; the alter-ego of Michael Keaton’s Riggan Thomson in Alejandro Gonzalez Inarritu’s ‘Birdman or (The Virtue of Ignorance)’. What’s Riggan doing whilst his inner demon and career-shading superhero delivers this opening line? Why, he’s meditating in the middle of his shabby, run down dressing room – hovering some four feet off the floor. And so begins Riggan’s unhinged story; a man made super famous by his superhero role 25 years ago, now trying to resurrect his career by directing, producing and starring in a broadway play. The role was not written for Keaton, but the similarities are obvious. Inarritu takes a single camera, cleverly making the whole thing look like its shot in one take – although obviously not, and practically shoves it in the faces of Riggan, and his nerve-wracking entourage including manager (Zach Galifianakis – a man on the edge of financial ruin), daughter (Emma Stone – just out of rehab) and cast (Ed Norton playing what I imagine is a cartoon version of Ed Norton and a twitchy Naomi Watts) as they all sink under the weight of their own self doubts and self importance at what feels like break-neck speed. No sooner have we dealt with one conflicting philosophical theory about art, acting, truth, or relationships then we are thrown into another – all set to a backdrop of clever set-ups like a play within a play which is actually a film although it feels like a play – see what I’m getting at? The characters make fun of themselves, of each other, of roles they have actually played and eventually of things you as an audience member have watched and all of this should be too much and too clever for its own good were it not for just how wonderfully silly, bonkers and downright funny it is. You get the feeling that at any moment – and very much aided by the scatty drum score that accompanies every scene, that the whole thing will just end abruptly and derail, but it doesn’t, it very much goes the distance. This is because it’s brilliantly directed and every performance is outstanding; most notable of all being Keaton’s. I’ve missed Michael Keaton. As a child of the 80s, I had two movie uncles; Bill. Murray and Michael Keaton. And whilst Bill Murray is your prickish, laid back movie uncle, gatecrashing your house party to serve tequila, Michael Keaton is the relative most likely to arrive at said party by driving a car through the wall with a goofy smile on his face – just me? And although he hasn’t been completely missing from our screens for the past twenty years, he’s definitely been less prolific and apart from his TLC-loving captain spot in ‘The Other Guys’, has steered clear of the kind of insane-character stuff that gave him his fame in the 80s. But Keaton is best with the straight jacket off. Even as ‘Batman’ up against Nicholson’s scene-chewing Joker, with little to do in the way of impact except for wearing the costume, he nearly steals the show with his “Come on, let’s get nuts!” line. That’s because he means it! Here, Keaton gets to pull out every trick he has and some we haven’t seen before as he lurches from one pre-show disaster to another. 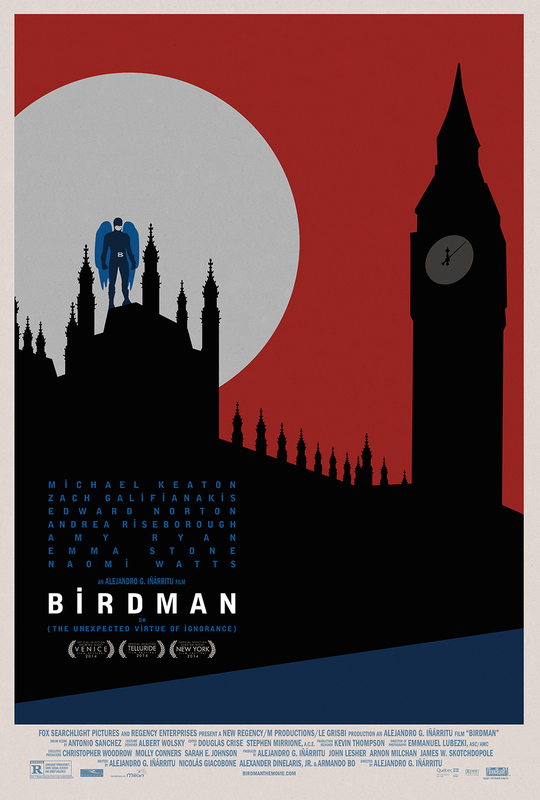 Comedy like this has missed his talents, and so have I.
Birdman or (The Unexpected Virtue of Ignorance) is in UK theaters from today. Moving from darker themed movies like The Experiment and The Downfall in his native Germany, director Oliver Hirschbiegel is now taking on the final 2 years of Princess Diana’s life. The most interesting part in these biographies is how much the actors manage to get into the skin of their subjects and Naomi Watts is quite a talented actress. Still the subject might still be a bit too touchy for a lot of people. Here is the trailer and the plot synopsis, how do you think Naomi Watts pulled off the role? Celebrated and adored by millions, she was the Queen of people’s hearts, yet the bittersweet story of the last man to truly capture hers has never before been told. Princess Diana (double Academy Award nominee Naomi Watts), at one time the most famous woman in the world, inspired a nation with her generosity, compassion and kindness – and in her final years she would meet the man who, in turn, inspired her. When Diana met Doctor Hasnat Khan (Naveen Andrews), she found someone who could see beyond the exterior, to the vulnerable and complex woman underneath. An incredible source of strength to her, it was during this relationship that Diana accomplished some of her most rewarding and successful humanitarian work. As Diana fell in love with Dr Khan, she didn’t just feel like a Princess – but like the woman she truly was. In a story that until now has remained untold, DIANA introduces a time in the Princess’s life that was uniquely important in shaping her final years, fulfilling her search for true happiness and sealing her legacy. The film is directed by Oliver Hirschbiegel, stars Naomi Watts and Naveen Andrews and is produced by Ecosse Films. Diana is released in UK cinemas on September 20th.